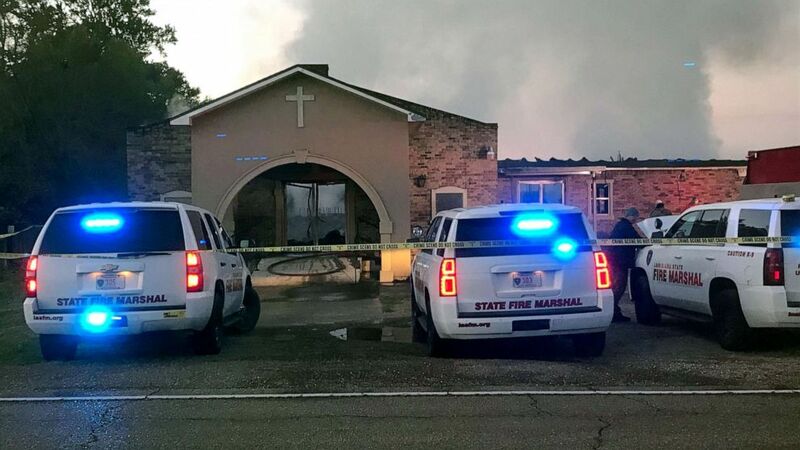 A suspect has been arrested in connection with a string of “suspicious” fires at historically black churches in Louisiana, authorities announced Wednesday. Three churches with predominantly African American congregations caught fire over the course of 10 days in St. Landry Parish, Louisiana, this month, destroying the buildings and sparking fears about a possible racist motive. U.S. Attorney David Joseph announced the arrest in a statement late Wednesday, saying the unidentified suspect had been taken into state custody. Authorities are expected to announce more details about the arrest at a press conference at 10 a.m. local time Thursday. The state’s fire marshal said investigators had identified “suspicious elements” in the case last week. The blaze at the St. Mary Baptist Church was reported on March 26, followed by Greater Union Baptist Church on April 2 and Mount Pleasant Baptist Church last Thursday. Officials have not determined the exact cause of the fires. A fourth fire was reported on March 31 at Vivian United Pentecostal Church in Vivian, about 220 miles northwest of St. Landry Parish. The state fire marshal confirmed that blaze was intentionally set inside the church and caused a small amount of damage before it burned itself out. Johnson noted that the fires had occurred within the same time span of another suspicious blaze in Tennessee, where a social justice training center was burned and tagged with anti-Semitic slurs. Anti-black racism in the United States continues to be a problem over half a century since the abolition of Jim Crow laws. These laws enforced segregation between black and white Americans in public places. Specifically, Attacks against African-American churches in the United States have taken the form of arson, bombings, mass murder, hate crimes, and white supremacist-propelled domestic terrorism. Violence against churches with predominantly black leadership and congregations have taken different forms across the decades. Arson attacks black churches have been documented as early as 1822, Emanuel African Methodist Episcopal Church in Charleston, South Carolina was burned down. This sort of crime does not just hit a building but also hits the confidence and faith of a community which is targeted. This triggers a chain reaction and can lead to vengeful attacks of various proportions. If worse comes to worst, it can lead to riots and civil wars. It is in the interest of the security of the nation and all communities, to prevent such attacks and quickly prosecute the perpetrators so as to send out a strong message of zero-tolerance towards such racial attacks. Many around the globe have been harassed due to discriminatory practices and racial attacks. Racism affects almost everybody on this planet. Whenever one leaves his or her homestead and becomes a minority, he or she becomes vulnerable to racism and discrimination. After Christchurch massacre which included the shooting of people attending a prayer session at a New Zealand Mosque, there has been an international outcry demanding quick action against racist people lurking amongst the general public. Stopping racial attacks at religious buildings has become the biggest challenge for Law Enforcement and National Security agencies in the United States as cracking this case within a record-breaking time is crucial to preserve the faith of Americans in the law and order system. Hundreds of perpetrators linked to hate crimes have been arrested, thousands of innocents have suffered/died around the globe. Yet, counter-terrorism units don’t have access to investigative and intelligence gathering tools which can reach the roots of this problem and act as a strong deterrent, which in turn can put an end to race-related crimes before they occur and/or screen the public for likely perpetrators. What is needed in Louisiana and all other hate-crimes and domestic-terrorism cases is a scientific and reliable ‘litmus test’ which is like a breathalyzer test. It is quick, objective and only detects the presence of the substance being tested. Likewise, the investigative agencies should be able to test if a suspect knows anything at all about the crime under investigation. Brainwave Science, a US based company has developed and provides a unique and intelligent security method which is able to distinguish between suspects and innocents. iCognative is a test which can determine if certain information is known to the person being tested or not. It does so with impeccable accuracy and statistical confidence. The information may be related to a certain crime, in order to detect if the person could be the perpetrator, or a witness or even unrelated. The information could also be information which a ‘brainwashed’ could have. In other words, if a person has been radicalized, then they would have been exposed to propaganda, forums, conversations, and ideas. The brain of such persons will always respond positively when they are shown related words of images. They will be familiar with certain images. iCognative uses a specialized headset which is worn by the person under test. Pictures, images, words or phrases related to a specific crime or related to the ideology being screened are shown to the test subject in succession. All this while, the headset looks for tiny positive voltages which the brain emits when it sees a stimulus it is familiar with. In this case in Louisiana, the stimuli which can be used in the iCognative test of suspect can be details of way the fires are believed to have started, the locations of the churches, the times and dates of each of the fires, the inflammable material used for the same, CCTV footage of nearby stores from where the materials are thought to have been purchased, pictures of other suspected racist persons in order to determine linkages between them, details of similar extremist incidences in order to determine if the suspect has committed any of them. The iCognative computer analyses these inputs from the headset and declares the result at the end of a usually 45-minute test. The result can be ‘information present’ or ‘information absent’. It signifies that the test subject’s brain does or does not contain the information being shown and then the authorities can proceed accordingly. iCognative is highly applicable in almost 90% of all civil and criminal cases. Contrast this with the DNA and fingerprints, which are applicable in only 1-2% of all cases. iCognative has all the characteristics which an investigation and interrogation tool must have. It is accurate (99+%), reliable, reports no false positives or false negatives, has no known countermeasures, is easy to deploy, easy to learn, highly customizable, highly portable, non-invasive, does not include sedation or administering of ‘truth serum’, totally objective, cost-effective and instant in its results. Finally, there is no reason for the authorities in Louisiana and elsewhere to not deploy iCognative at all recruitment centers, immigration, and border checkpoints, at interrogation and in an investigation.